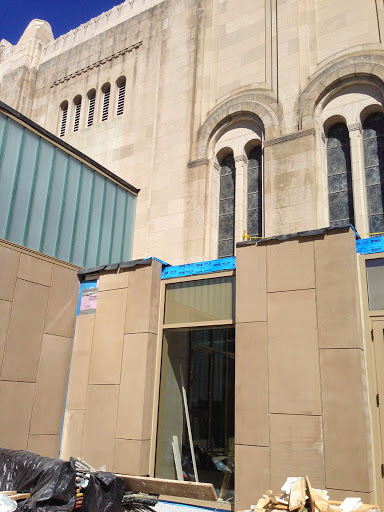 Crews install new hand-cut, Golden Jerusalem Limestone stairs at the Rodeph Shalom synagogue. 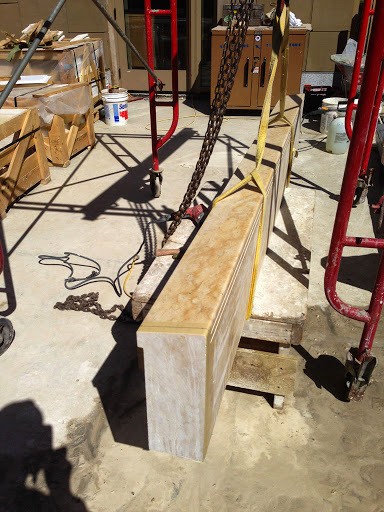 The challenge was how to get the 25 treads, at 800 pounds each and 8 feet long, from their shipping crates set onto the staircase inside the building. 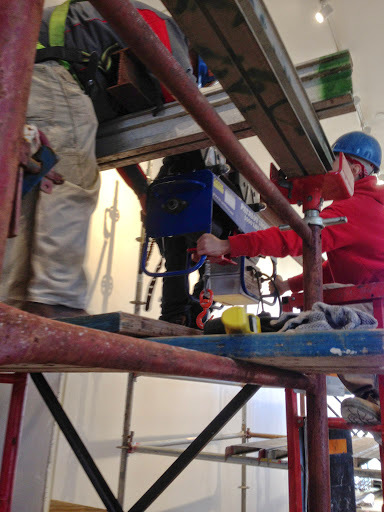 The solution, from Superior Scaffold, came in the form of two high-load scaffold towers with an 18’ long steel beam running in between them, then incorporating a Hi Tech Patriot 1000 cable hoist to do the lifting. 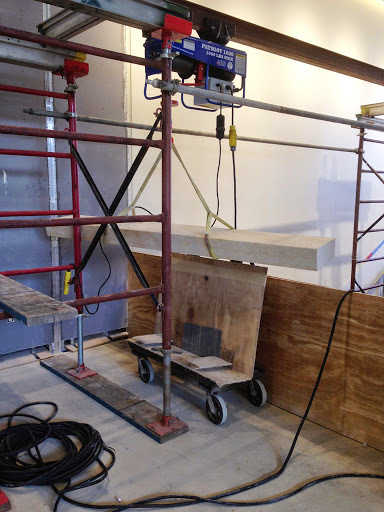 The hoist was able to travel along the steel beam to pick up the heavy stairs and then move them over to the particular position and then lower them down into place. 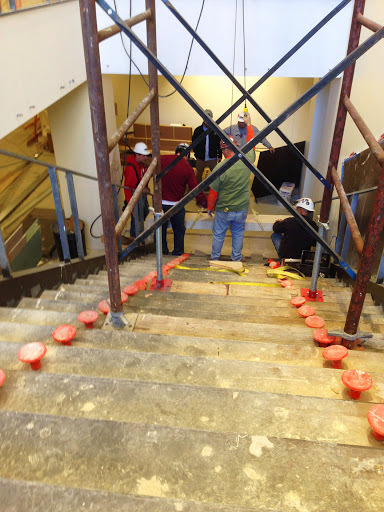 Each stair was dollied inside from the exterior staging area and set down near the hoist. 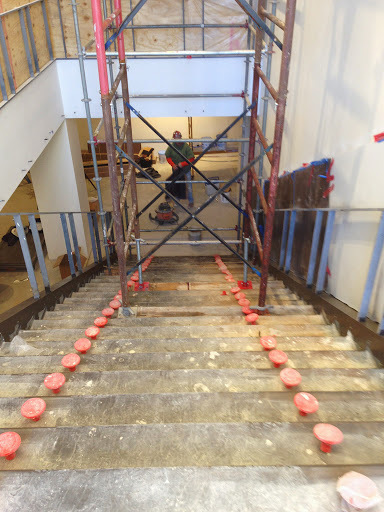 This setup was done in two stages: the first actually having one of the stair towers standing directly on the staircase to set the lower sandstone stairs and then the second stage was moved up above the staircase to set the upper stairs. 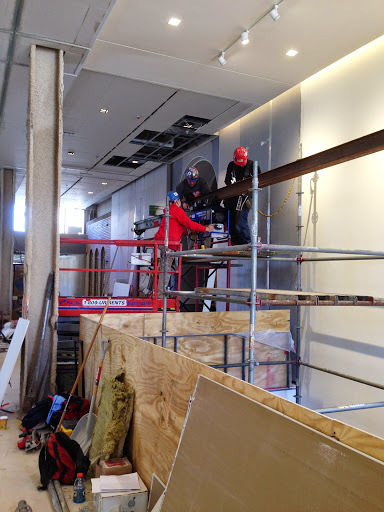 Here you can see the crew putting the Patriot 1000 into place on the steel beam. 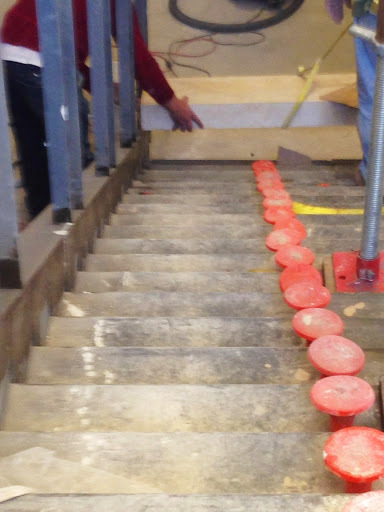 The hoist would then lower the massive stairs into place where crew members would use a concrete adhesive to permanently set them. 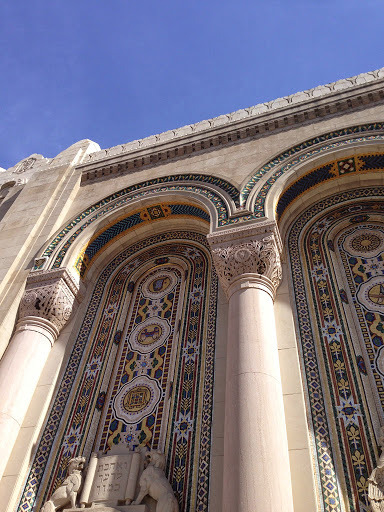 This incredible upgrade goes with the unique motif of the rest of Rodeph Shalom that was inspired by the great Synagogue of Florence, Italy. 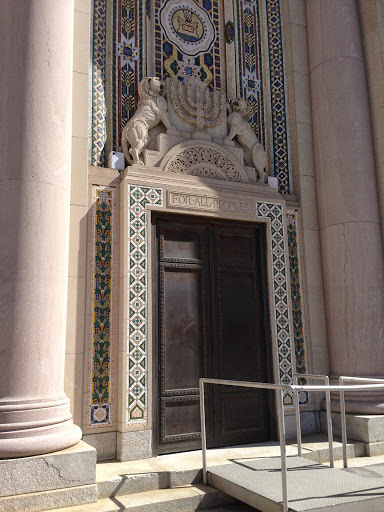 It is one of the only synagogues in the United States that retains the Byzantine-Moorish style. 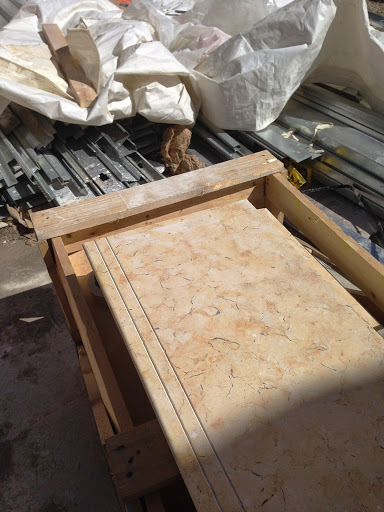 Each stair was hand cut from Golden Jerusalem limestone and was 5.5” high X 1’ 2” wide X 8’ 2” long and shipped from Jerusalem. They were staged out in this courtyard and moved inside using a dolly (come-a-long) and straps. 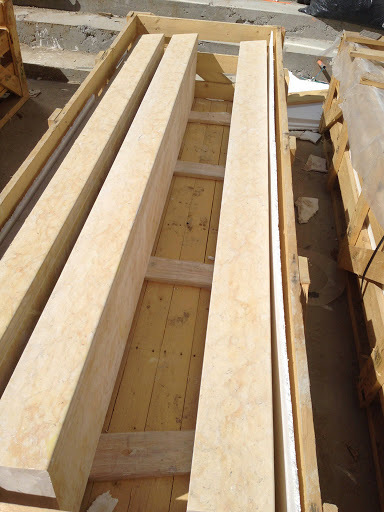 The scaffolding had engineered drawings to make sure the weight calculations were correct. 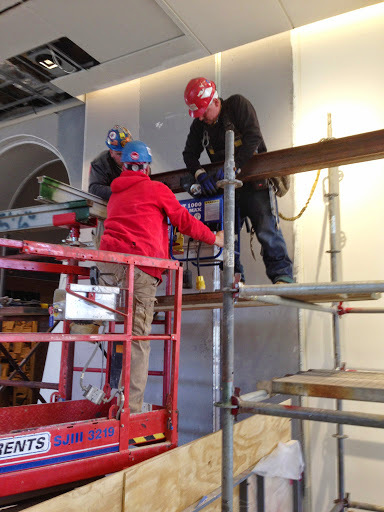 The general contractor was Intech and the sub was Belfi Brothers. 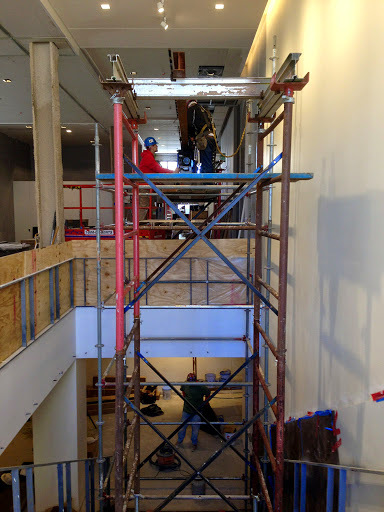 Superior Scaffold was proud to be a part of this prestigious project. 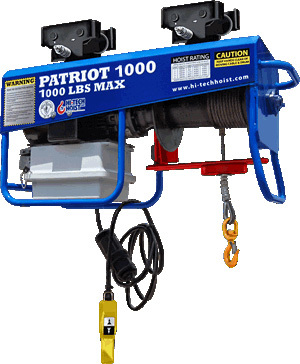 Our material hoists are great for this type of project. 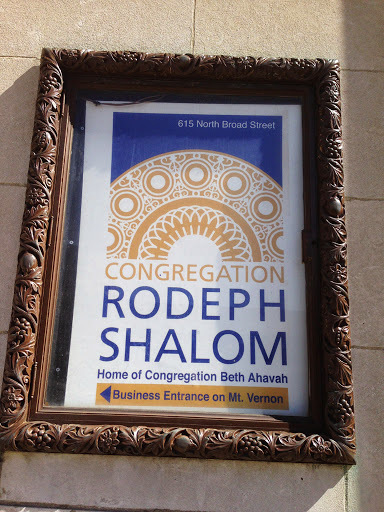 Rodeph Shalom is a Reform congregation in Center City Philadelphia. 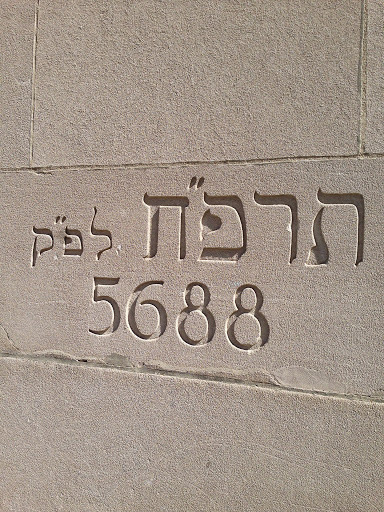 It is welcome all who come to explore or deepen their connection to Judaism and God. 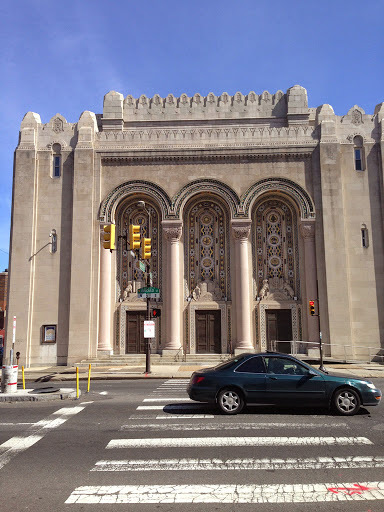 This entry was posted on Tuesday, April 14th, 2015 at 6:00 am	and is filed under News & Updates, System. You can follow any responses to this entry through the RSS 2.0 feed. Both comments and pings are currently closed.